As much as I love buttercream frosting, sometimes it’s fun to fill my cakes with something different. It’s a bit unconventional, and definitely on the indulgent side, but edible cookie dough makes the most amazing cake filling. At first thought you might think that cookie dough would be too heavy, or too sweet…but that’s the best part about this cookie dough filling! It actually adds a great texture (the mini chocolate chips even add a bit of crunch), and is surprisingly less sweet than my American buttercream. The secret to making my cookie dough layers even and symmetrical is to shape them into giant cookie dough disks! I like to use Saran Wrap to line three cake pans (either same size as the cake layers, or slightly smaller), and then I press the cookie dough evenly across the pan using the bottom of a glass cup. I like to use enough cookie dough to make each disk about 1cm tall, but you can make them however thick you like. To freeze the cookie dough layers, I fold the overhanging saran warp over the top of the layers, and place them on a flat shelf or on a cake board in the freezer. It’s important that they freeze perfectly flat, so that your cake will be be level once it’s assembled. The cookie dough disks keep in the freezer for up to a month, as long as they’re properly wrapped. If you plan to freeze them for more than a few days, you can pop them into a freezer bag to ensure they stay fresh. This cake has quite a few components, so I highly recommend splitting up the work over a few days! I made the edible cookie dough, chocolate ganache, and the cake layers a few days in advance, and then made the buttercream right before I assembled the cake. I am a huge proponent of prepping in advance, so that I can truly enjoy the decoration of the cake (which is my favorite part). 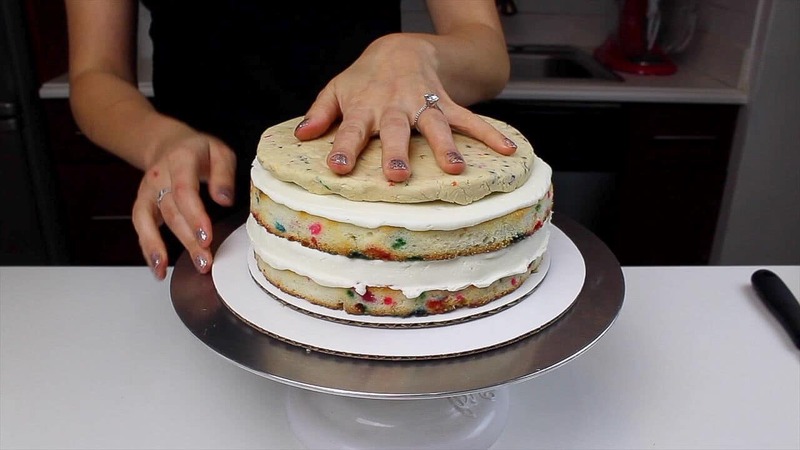 Begin by making the Funfetti Cake Layers. Preheat oven to 350°F. Line four 8 inch pans with parchment rounds, and grease with non-stick cooking spray. On a low speed, mix in eggs one at a time. Beat on low until just incorporated. Mix in the buttermilk in two installments, on a low speed. Add vanilla extract, almond extract, and oil, and mix at a low speed until fully incorporated. Scrape down the sides of the bowl with a spatula, then beat on medium speed for about 30 seconds. Gently fold in the sprinkles using a spatula. Divide batter evenly between the four prepared cake pans. I like to use a kitchen scale to know that I have the same amount of batter in each pan. Bake for 32-34 minutes (or until a skewer comes out clean). Allow the layers to cool in the pans for 10 minutes, then run an offset spatula around perimeter of the pan to separate the sides of the cake layers from the pan. Place the cake layers into the freezer for 45 minutes, to accelerate the cooling process. Once the layers have fully cooled, I like to trim the caramelized bits from the sides of the layers using a serrated knife. While these layers bake pretty flat, sometimes I’ll also trim the top of the layers too, to get my layers perfectly level. While the cake layers bake and cool, make the vanilla buttercream frosting. Beat the butter on a medium speed for 30 seconds with a paddle attachment, until smooth. Slowly add in the powdered sugar, 1 cup at a time. Alternate with small splashes of cream. Once fully mixed, add in the vanilla extract and salt, and beat on low until the ingredients are fully incorporated, and the desired consistency is reached. If the frosting is too thick, add in additional cream (1 teaspoon at a time). If the frosting is too thin, add in more powdered sugar (quarter of a cup at a time). The amount of heavy cream you need can vary based on the type of butter you use, the temperature of your ingredients, and the temperature of your kitchen, so please adjust as needed :). To make the edible cookie dough, place butter and brown sugar into bowl, and beat on medium speed using a hand mixer or the whisk attachment of a stand mixer. Once the butter and brown sugar are creamed together, mix in the salt, heavy cream, and vanilla. Next mix in the flour, one cup at a time. 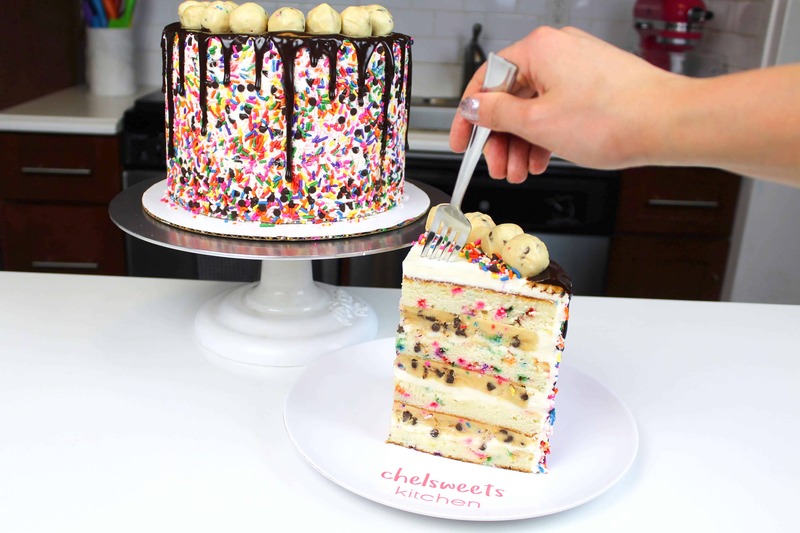 With a spatula, gently fold in the chocolate chips and sprinkles until they’re evenly spread throughout the dough. The batter should be sturdy enough to shape with your hands. If it still seems too tacky, add in more flour (1/4 cup at a time). If your dough is crumbly or isn’t sticking together, add in more heavy cream (1 Tbsp. at a time). Line three eight or seven inch pans with Saran Wrap, and shape three cookie disks in each pan. 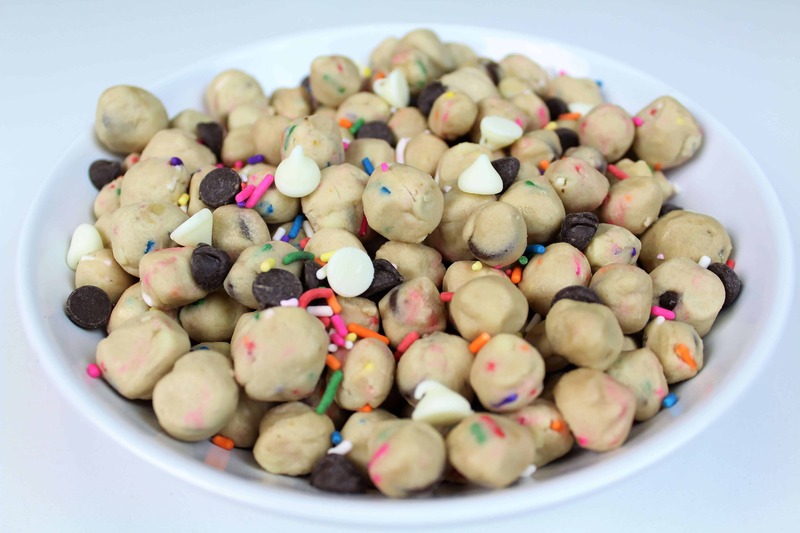 Use the remaining cookie dough to create 1 inch cookie dough balls, to decorate the top of the cake. Place the cookie dough disks and balls into the fridge to firm up, or in the freezer if they’re made in advance. The last component of this cake is the chocolate ganache drip! Heat heavy cream in a heat-proof bowl in the microwave for 45 seconds to 1 minute, until it just begins to bubble. If you don’t have a microwave or prefer to use the stove top, you can heat the cream over a medium heat in a pan until it begins to simmer. Remove from heat. Gently pour chocolate chips into the heavy cream, making sure they are fully covered with cream. Allow mixture to sit for 1 minute. Stir slowly until the cream and chocolate are fully combined, and ganache is silky smooth. Pour into a plastic squirt bottle, to help you easily add the chocolate drips around the cake. If you don’t have any plastic bottles on hand, you can also use a spoon to drizzle it over the edge of the cake. Set aside to cool for about 20 minutes (or place in fridge for about 10 minutes). You can also make this in advance, and store it in the fridge until you’re ready to use it. When you’re ready to decorate the cake, heat the ganache in three 15 second intervals, or until it reaches the right viscosity. It should be slightly warmer than room temp, but to hot enough to melt your the buttercream on your chilled cake. Then it’s finally time to assemble the cake!! Begin by adding a dab of frosting onto your cake board or cake plate. This will help keep your cake layers in place as you frost and stack the layers. Use a large offset spatula to spread a thin, even layer of frosting onto each cake layer. Unwrap the chilled cookie dough disks, and place one top of the frosting. Repeat with remaining cake layers. Next, cover the cake in a thin layer of frosting, to trap in any pesky crumbs! Use a bench scraper to get the frosting really nice and smooth, then pop your cake into the fridge or freezer to allow the crumb coat of frosting to chill and firm up. Once the crumb coat is firm to the touch (takes about 5 minutes in the freezer), cover the cake in a second, thicker layer of buttercream frosting. You can see an in-depth tutorial on how to get super smooth sides on your cake here. 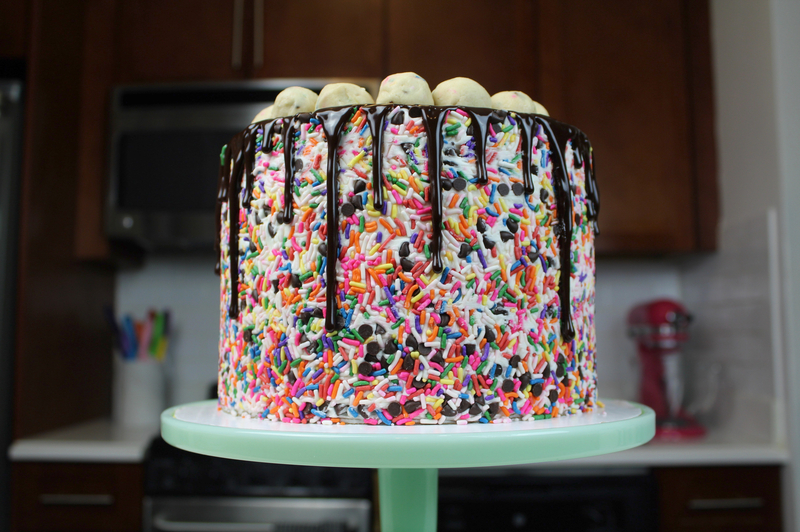 When the second layer of frosting is smooth, cover the cake in sprinkles and mini chocolate chips. 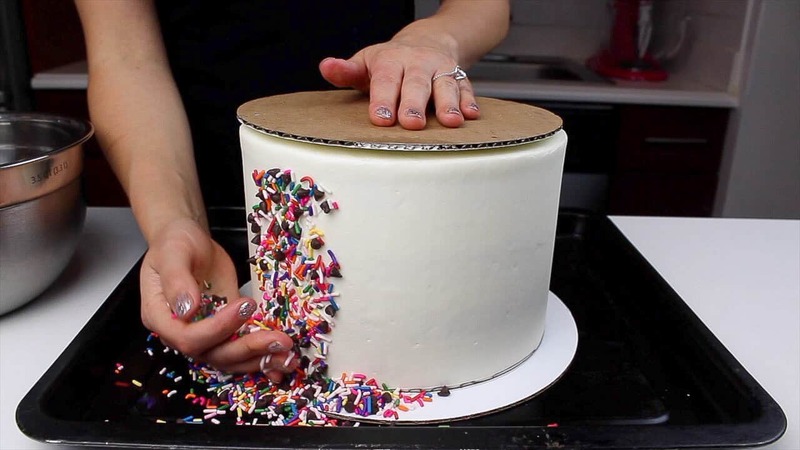 Place the cake board in a lined baking sheet, and use your hands to carefully cover the sides of the cake in sprinkles. Use a cupping motion, and gently scoop the sprinkles up the sides of the cake. I topped the cake with an 8 inch cake round, to help me keep the cake in place while adding the sprinkles, and also to keep them off the top of the cake. Once the sides are completely covered, chill the cake in the freezer for another 10 minutes, to prepare it for the warm chocolate drips. Once the cake is chilled, it’s drip time!! I prefer to use a bottle, since it makes the process so much easier, but I also like the way drips look when they’re added to a cake using the spoon method. Two factors are critical to getting a perfect drizzle! The first is that your cake is properly chilled. Once frosted, you should allow it sit it your fridge for at least 20 minutes, or in your freezer for 10 minutes, so that the frosting is cold and firm to the touch. The second important aspect of a drip cake is the temperature of the ganache!! It should be slightly warmer than room temperature, but not so hot that it melts your buttercream as you drizzle it! The best way to ensure your ganache is the right temperature is do a test drip. You can’t tell, but the first drip on my cake below was a test drip. Once I knew i had my ganache at the right temperature, I continued adding my drips. MAKING A TEST DRIP IS SUCH A CRUCIAL STEP!!! Make one drip on the side of your cake, and let it flow. Allow it to sit for a couple minutes. See what it looks like, if it’s the length and look you’re after. If not, adjust as needed. Either pop the ganache into the fridge for a couple minutes to allow it to cool off a bit more, or pop the bottle (or bowl) in the microwave and heat for 5-10 seconds. I also have a detailed video tutorial showing exactly how I add drips to my cakes here. Once you’ve added chocolate drips around the sides of the cake, top the cake with the chilled edible cookie dough balls. This cake feeds 20-25 people depending on the size of your slices, and cuts beautifully!! Be sure to use a sharp knife, and run it under some hot water (and dry using a paper towel) before cutting into the cake, to help you get a super clean cut. I absolutely love your cake recipes and I was wondering how the density of this cake compares to your vanilla cake recipe? I was going to do a funfetti version just by adding sprinkles to your vanilla cake recipe right before I saw you posted this one. If I want a lighter cake, does it make more sense to use egg whites which are in your vanilla recipe instead? Thanks! Can you buy heat treated flour or do you do it yourself? If I wanted to make funfetti cupcakes, could I use this recipe? Or should just add sprinkles to your vanilla cupcake recipe. And how much would I add? I would recommend using my vanilla cupcake recipe, and adding in some rainbow sprinkles 🙂 My cake recipe is great bc it bakes flat, but that causes it to make terrible cupcakes! How do you get each layer of cake to bake even? Can we omit the almond extract? Should we replace it with more vanilla extract instead? Hi Lauren! I would replace the almond extract with vanilla extract if you don’t want to include it ?? I love the taste of the funfetti cake layers, but I cannot get mine to stop sinking. I used fresh baking powder and soda, and made sure not to over mix the batter. Do you have any other suggestions I can try to get it to bake evenly? I’d recommend letting them bake a little bit longer in the oven! where i live, there is not purpose flour (heat-treated, or heated in the oven or microwave to 165 degrees F), how can i made it? There actually isn’t heat treated flour where I live either! That’s why I shared that bit in the parenthesis, you can heat your flour in the microwave for about a minute, or the oven for about 5 minutes, until it reaches 165 degree Fahrenheit ? How would you adjust your recipe for a 6 inch layer cake?